Some members of the NAACP protested outside a suburban Phoenix school Monday after a photo of students spelling out a racial slur with T-shirts showed up on social media last week. 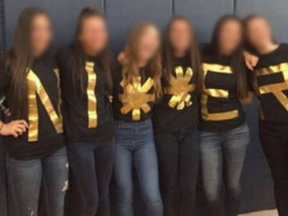 The photo showed six smiling Desert Vista High School senior girls with their arms around each other, wearing black shirts with letters or asterisks written on them in gold tape. Since the photo went viral Friday, an online petition has started calling for students involved to be expelled and the principal be fired. One of the girls spoke to reporters outside the school Monday afternoon, saying she is not a racist and is “incredibly sorry” and asked for people to forgive her. The Rev. Jarrett Maupin and other Phoenix-area civil rights activists met with Tempe Union High School District officials over the photo. The district officials declined to discuss possible punishment for the students. “We have an opportunity as a community to face this together and address it and to say there’s no place whatsoever for any type of racial slur or racial prejudice in our community and in our state and in our nation,” Dr. Kenneth Baca, superintendent of Tempe Union, said at a news conference. Dr. Anna Battle, assistant superintendent of district operations for the school district, said the offensive photo resulted from a game of “human Scrabble” after seniors gathered for a panoramic photo with the message “Best You’ve Seen Class of 2016” with an asterisk between each word. One of the students then decided to create the offensive word as a joke with one of their boyfriends, according to Battle.